•Double digitised polylines are often hard to see. 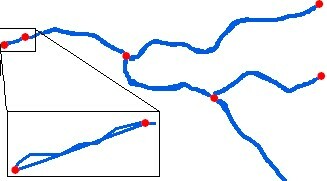 RivEX searches the river network looking for polylines that share the same From and To nodes. This will identify genuine braids that are not actually errors. RivEX then checks all these braids to see if they intersect each other, other than their nodes; if they do then the polylines must be double digitised. •RivEX will return the ID number of one the polylines. This may not be the erroneous polyline! RivEX has simply identified a location with a problem. It is up to you, the user, to make the informed decision on which polyline to remove or edit. Maybe it is due to poor digitising and there really are two channels or it's a data capture error and one of the polylines need to be removed? •RivEX searches for these types of errors over the length of a single polyline. If your double digitising occurs over two or more polylines these will not be identified. The image below demonstrates this issue. 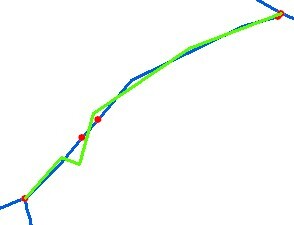 The green line is a single polyline. The reach it represents has been captured as four polylines by the underlying blue polylines. Thus the green polyline does not share it's nodes with a single polyline. In this case it is probably safe to delete the green polyline.